When I recently made the Sweet Azuki Bean Paste I was immediately struck by just how similar in flavour it was to chestnut puree. This started me thinking, always a dangerous occurrence, of just how interchangeable they could be. 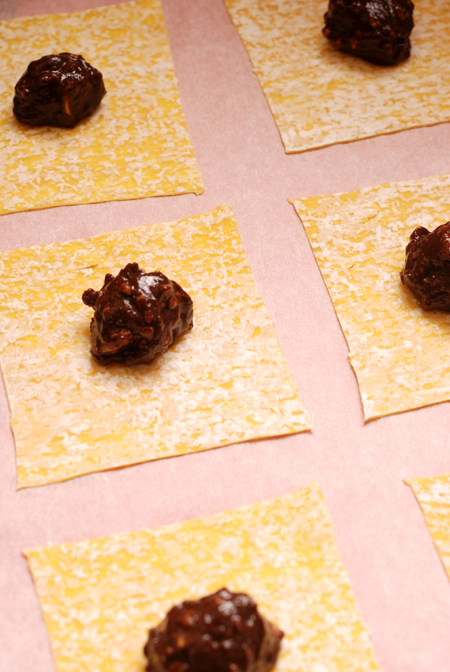 One of my all time favourites are my mothers sweet chestnut ravioli and in theory it should work using the bean paste. Having Chinulille at a recent dinner reminded me just how good they were and was a signal that I should go ahead and experiment. In my mothers original version she uses the same dough as she would for crostoli. 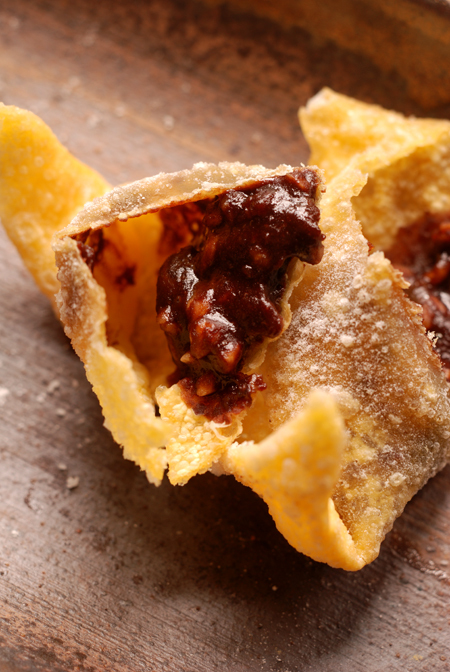 For the filling, chestnut puree is mixed with berry jam, cocoa powder and roasted nuts. The dough is rolled out and cut into rectangle and formed into ravioli like shapes. This is then deep fried until golden and puffed. There's no recipe for the filling, it is something that you need to make by taste. The bean paste is thick, adding jam will slacken it so you need to careful that it doesn't become too soft. Cocoa powder and the crushed nuts help to thicken the mixture - the cocoa also deepens the flavour and cuts down on the sweetness of the jam, the nuts and I used a variety of nuts, bring in their own flavour and crunch to the an otherwise smooth filling. The end result should be a mix that will hold its shape. Wonton wrappers do dry out quickly so only work on a few at a time and keep the rest under a damp towel. I used a small ice cream scoop to place a mound of filling in the center of each wrapper. Moisten all the edges with cold water. Take the wrapper in your hand and fold to form a triangle - as you do, push out all the air around the filling and squeeze the edges together to form a tight seal. 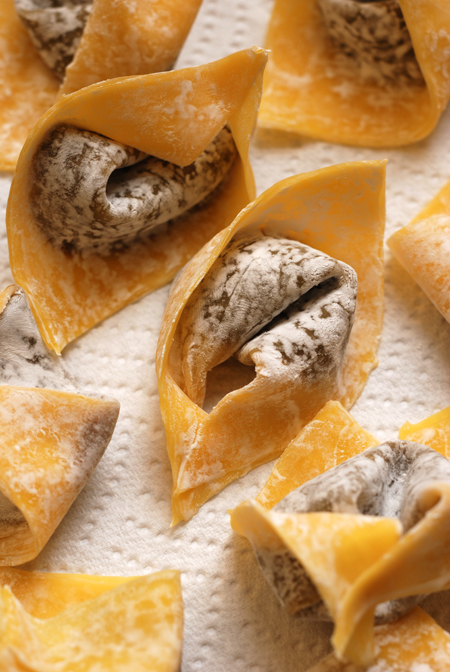 Then twist the tips around the filling to form this tortellini shape. There's no need to be too precious about getting perfectly identical shapes but do focus on having those edges sealed. Deep frying is one of those things people are a bit scared of but I think this comes from the idea that you have to boil large pots full of oil. I use a small saucepan with about 1 to 2 cups of oil - this smaller size and quantity makes the whole process a lot more controllable and lot less intimidating. 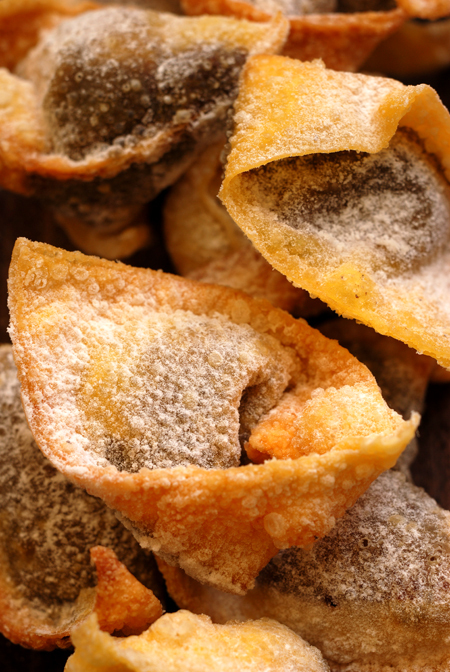 These wontons will cook in about 30 seconds to 1 minute - you don't want them to fry too quickly as you want some of the heat to penetrate the filling. To test when the oil is ready I used torn bits of wonton wrapper - when they start to bubble and rise when you drop the pastry in you'll know the oil is at the right temperature. If they sink to the bottom, oil is too cold, if they immediately bubble, it's too hot. Most importantly, don't overcrowd the pan, cook 1 or 2 at a time. Once cooked, place on paper towels to remove any excess oil - if you've cooked them at the right temperature you'll find that they aren't greasy. Place them in a bowl and dust generously with icing sugar, making sure all sides are covered. They will now be ready to serve. The pastry will rise against the filling creating a lovely crisp hollow. The filling, is sweet and nutty, with the bitter notes of cocoa - the azuki bean paste completely fills the role of chestnut puree in providing that mouth coating feel you expect. The final product though made so differently to the original completely retains the spirit of those much loved ravioli. Great job! They look so amazing I want to reach into my monitor and try them right now. Yum! oh, i'm definitely the one who is terrified about frying. what can i do, i really want your wontons!!!!!!!! 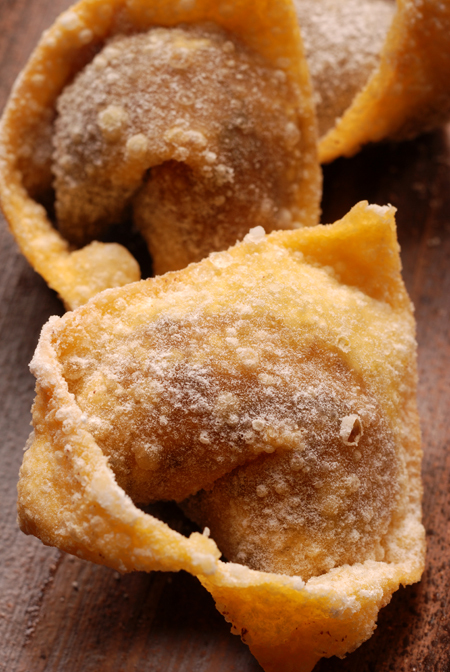 What a great adaptation to traditional wontons. Nice touch with the icing sugar. I wonder how it would go if you did half icing sugar and half matcha green tea powder.